Like many villages throughout England, Wing sent a good proportion of their men off to WWI, some of whom of course were not lucky enough to return. I would be surprised if there was a single Wing family not touched by this war, including the Rothschilds whose son Evelyn was killed. Below are details of the Wing-connected men that I have identified as serving in this war. If your Wing ancestor served in WWI and is not listed below, please email me and I will add them. This list was dramatically expanded in August 2014 as part of a project to research all known servicemen with Wing connections. Profiles of each man (and woman!) including further details of their service will appear online over the 2014 to 2018 centenary period, along with detailed references, but do feel free to email me in the meantime if you would like to know more about anyone in particular. Some of the men listed, like George Taylor, served in the 2/4th Battalion of the Oxfordshire & Buckinghamshire Light Infantry. 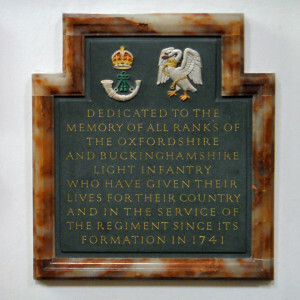 This particular battalion’s contribution to the war can be found in The Story of the 2/4th Oxfordshire & Buckinghamshire Light Infantry by G.K Rose (text available for free at Project Gutenberg) – useful background reading even if your own men weren’t in this particular battalion or regiment. Another book available for free online at the Internet Archive is The First Buckinghamshire Battalion 1914-1919 by Captain Philip Lowndes Wright, which tells the story of the 1/1st Battalion of the Oxfordshire & Buckinghamshire Light Infantry. There is a memorial to the fallen soldiers of OBLI at Christ Church Cathedral in Oxford, pictured below. I swear by Almighty God that I will be faithful and bear true Allegiance to His Majesty King George the Fifth, his Heirs and Successors, in Person, Crown, and dignity against all enemies, and will observe and obey all orders of His Majesty, his Heirs and Successors, and of the Generals and Officers set over me. So help me God. 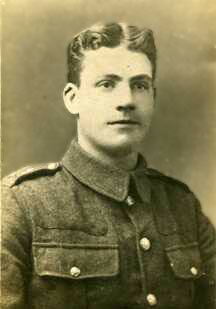 WOOLHEAD Private Joseph, No 1 Canadian Army Aux. CWGC – Commonwealth War Graves Commission website – check their detailed entry for parents/spouses. MI – Memorial inscription, All Saints Church, Wing.